Tired of constantly being yelled at by your in-game sergeant? Now you can return the favor. Voice commands are one aspect of modern gaming that is typically hit-or-miss, and it seems to miss more often than not. For whatever reason, current technology doesn't seem capable of interpreting human speech reliably - especially when the parsing of a voice command could mean the difference between life and death for your in-game avatar. The Xbox One, with its new and improved Kinect, could finally achieve reliable speech recognition, and Activision seems to believe it can. To that end, Activision boss Eric Hirshberg has confirmed that Call of Duty: Ghosts will feature Kinect voice commands - a series first. 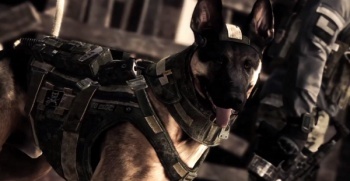 "I made a passing comment that you're going to see voice integration, voice commands via Kinect," Hirshberg said in an interview, "which is something that we haven't done in the past with Call of Duty. We think the improvements to Kinect really excite us because of the level of responsiveness and detail. I thought that the demo they did with the voice commands on television, the instant changing between games and music, was really compelling. You'll see more of this coming from us as we get closer to launch." Series veterans are likely groaning by this point, but Hirshberg is confident that it won't just be a gimmick to mention on the back of the box. According to him, the oft-heckled mantra of "Better with Kinect" will hold true in this case. "We've always made sure that we don't just use new technology for novelty's sake," he says. "We always make sure that it makes the gameplay better. In this case, we think it will." Alright, so the new Call of Duty is going to have voice commands. But what commands should it have? We know that this entry will focus on a singular, persistent squad, so giving orders to your individual squadmates could reinforce the sense of teamwork that the developers are going for. Personally, I have but one request: if I can use the Kinect to tell my canine companion what a good dog he is, I'll get my wallet out right now.